It’s November, and everywhere we go the shops are festooned with decorations. My daughter is three and a half, and mesmerised by anything shiny and glittery, but alas, Hanukkah decorations are not so easy to come by. I have no plans for a “Hanukkah bush”, but am happy to indulge her interest in sparkly things for the festival of lights and we spent a very pleasant afternoon making these star-shaped ornaments to stick on a window. 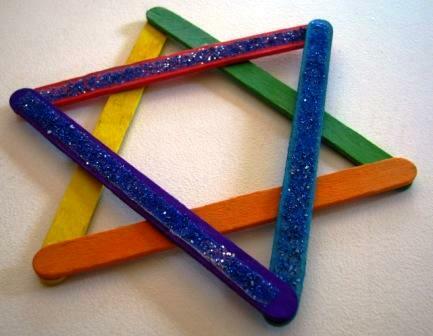 – popsticks (6 per star). I bought coloured ones from a craft store. – blu-tack, to stick the finished product to a window. Alternatively you could use a ribbon or fishing line or similar to hang them. 1. 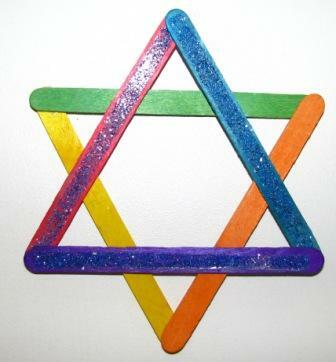 Decorate your popsticks. My daughter wanted glitter (and lots of it!) but I didn’t want a big gluey mess, so I put some double sided tape on the sticks, and she put the glitter on that. Just tap off the excess and you’re done. 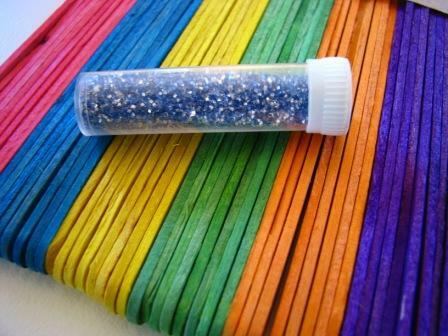 Leave the end 1cm of the sticks clear of glitter to make it easier to stick them together. 2. 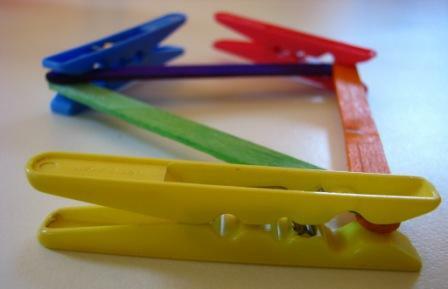 Use pegs to hold three sticks together (this helps you get the right angles). Stick together using a suitable glue or double sided tape, and leave clamped with the pegs until firmly bonded together. Repeat with remaining sticks. 3. Place one completed triangle on top of the other – there will probably only be two points of contact – and glue together and clamp again. 4. 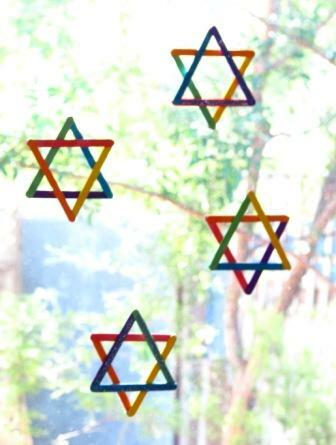 Blu-tack your Magen David ornament to a window, step back and admire.